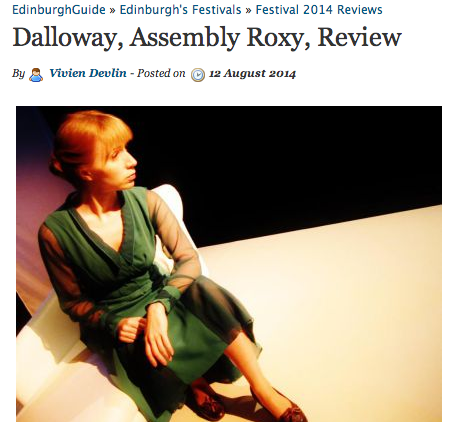 Mrs. Dalloway is on stage in Edinburgh now and will be on the BBC soon. A stage version of Woolf’s novel is part of the 2014 Festival Fringe through Aug. 25 at Assembly Roxy, 2 Roxburgh Place, Edinburgh, Scotland. BBC Four’s new series The Secret Life of Books will feature Woolf expert Dr Alexandra Harris speaking on the novel. A date for the broadcast has not been set. The series includes six 30-minute programs that examine original texts, manuscripts, letters and diaries behind the creation of six classic books, including Mrs. Dalloway. Dr Alexandra Harris believes Mrs Dalloway is a book about madness that Virginia Woolf wrote so that she could remain sane. Using Virginia Woolf’s diaries and the original manuscript of Mrs Dalloway, Alexandra tells the poignant story of how Woolf battled to transform her private demons into one of the most daring novels of the interwar years, and the book that would make her name. This video tour of Virginia and Leonard Woolf’s Monk’s House in Rodmell, Sussex was produced by the BBC and is hosted by Paul Martin. If you haven’t walked in her steps through England — or even if you have — this is a great way to get an up-close look at the Woolfs’ longtime home. Last night I spoke about walking in Virginia Woolf’s footsteps when I traveled to England several years ago. The occasion was a meeting of the Medina County Branch of AAUW. As I talked about the sights and sounds of London, Sussex, Kent and Cornwall that connect to Virginia’s life and work, several thoughts struck me. Since AAUW is an organization that promotes equity for women in girls in both the workplace and in educational settings, I felt compelled to remark on Virginia’s lack of opportunity for formal education. And since I spoke about meeting Cecil Woolf and Dr. Ruth Gruber at Woolf conferences — two people who had known or met Virginia — I got to thinking about how special it is to have seen and heard her in person. Those experiences are impossible for us today. But a two-disc CD set from the British Library allows us to experience Virginia and other members of the Bloomsbury group in another way. “The Spoken Word: The Bloomsbury Group” came out this month. Producers searched the BBC archives to present 24 recordings of the group’s major figures talking in their own words. Many of them are rare and previously unreleased. According to the London Review Bookshop‘s Web site, “Highlights include Virginia Woolf talking about the importance of language, Leonard Woolf’s who’s who of the Bloomsburys, Duncan Grant discussing the infamous ‘Dreadnought’ hoax and Elizabeth Bowen describing legendary Bloomsbury parties.” You can get the full list here. Woolf’s voice, along with those of other great writers of the 20th century, can also be heard on a three-disc set of CDs produced by the British Library called “The Spoken Word: British Writers.” Read more. Let’s all thank our lucky stars for the enlightened souls at the BBC who saved eight minutes of Virginia Woolf’s recorded voice. It is the only recording of her voice that has survived from the three broadcasts she did for the BBC in the 1930s. 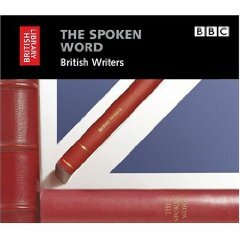 The set features the voices of 30 British writers and includes many previously unpublished recordings. Another set, “The Spoken Word: American Writers,” features 27 authors from the U.S. When Woolf’s recordings were made, people simply didn’t keep radio broadcasts, according to Richard Fairman of the British Library. “They went out on the air and that was it; they were lost forever,” Fairman told NPR‘s Melissa Block. “The recording of Woolf is nothing like the interviews common on the radio today,” he said. Hearing the voices of famous authors on CD is “not quite as good as having them walk up to you, but it’s not bad,” he told the Telegraph. 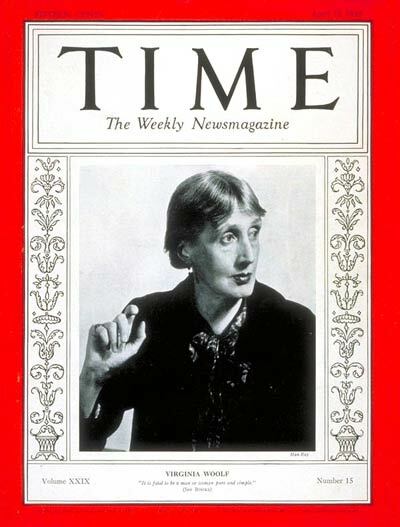 You can listen to Woolf talk about “Craftsmanship” in the series “Words Fail Me,” which was broadcast on the BBC April 29, 1937, here. On You Tube, you can watch a video featuring a record spinning on a turntable that gives us eight minutes of Vita Sackville-West reading from her prize-winning poem “The Land.” The recording was made by Columbia in 1931 for the International Education Society. You can also search the British Library’s online archive of more than 1,500 sound recordings that it has made here. Read more in brief about the British Library CD sets of famous authors in the London Review of Books, Time and the Telegraph.